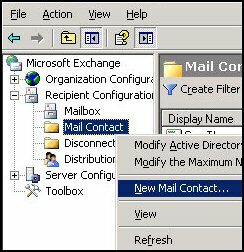 This page explains how to create Contact and – Mailcontact objects in Exchange 2007. 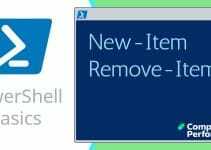 If you are looking for a straightforward example to learn Exchange 2007 PowerShell commands, then Mailcontact is an ideal vehicle to practise. The key verbs are: get, new and disable. To begin with, I recommend a walk-through with the Exchange Management Console. Firstly it will clarify the objects that we are creating, secondly it will alert you to nuances such as Aliases don’t have spaces. Type these commands after you have created a new mail object with the GUI, and again after you employ PowerShell to create the Mail Contact. Note 1: As with so many PowerShell nouns contact is both case insensitive and singular. 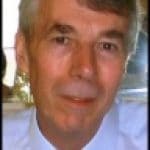 Get-mailcontact | ft -autosize name, alias, ExternalEmailAddress. Note 2: ft is an alias or shorthand for Format-Table. Disabling is different from deleting the object. Disabled Mail Contacts appear in the Exchange System Manager and can be verified by comparing Get-Mailcontact with Get-Contacts. 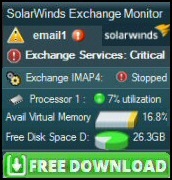 You can also confirm by checking the contents of the Disconnected folder in the Exchange Management Console. Note 3: For names with spaces, enclose them with single quotes. It's possible to use PowerShell to read and even manipulate the Outlook Client. Here is an example which lists the senders' email addresses in the Inbox folder. Mailcontact is an Exchange object and a PowerShell noun. In order to control Mailcontact, master the verbs get, new and disable.